In true Charles Stinson fashion, the home is designed in a cascade of horizontal planes characterized by a multitude of spacious windows to allow for sweeping views and an abundance of natural light. 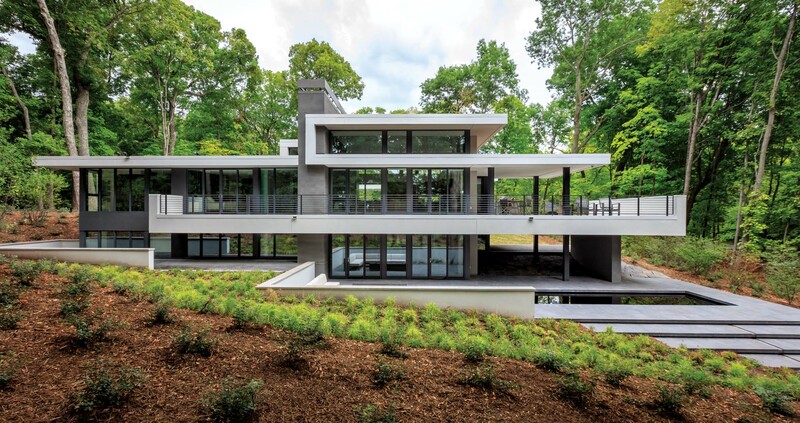 The signature characteristic identifying a Charles Stinson-designed house is the geometry of vertical lines and horizontal planes that the Wayzata architect layers to define spaces, frame views, and capture light. How he gets there is equally intriguing. It begins with the location. As he describes in his book, Charles R. Stinson Architects: Compositions in Nature, he walks the site, taking into consideration sun and shade, geography and vegetation, and the client’s needs. Then he imagines the design concept floating on the site, he explains, and brings in “the simple, individual forms—the thinner the better, and one at a time—to define uplifting, inspiring living spaces” that will serve multiple structural and aesthetic functions. While conceptualizing a new home in Deephaven for healthcare visionaries and philanthropists Edward Bergmark and Juleen Christopher, Stinson found the heart of the home after standing on a downed tree, says Josh Norman, CEO and president of Wayzata-based Modern Oasis Architecture. Norman adds that the couple wanted to see water and woods on their untouched wooded lot, not a manicured landscape. And they wanted the house, located next to a lake, to be as unobtrusive as possible. The same bleached rift white oak—finished with a white stain—is used in both the master bedroom and bath. The 5,000-square-foot house, anchored on one end by the garage and the broad vertical chimney, reaches toward the opposite side of the lot where decks with an uptick at the ends provide definition and a sense of enclosure. Built on a glacial moraine, Norman explains, the house cascades via a sculptural assemblage of horizontal planes from the top of the site, past a reflecting pond, and down to the lake. 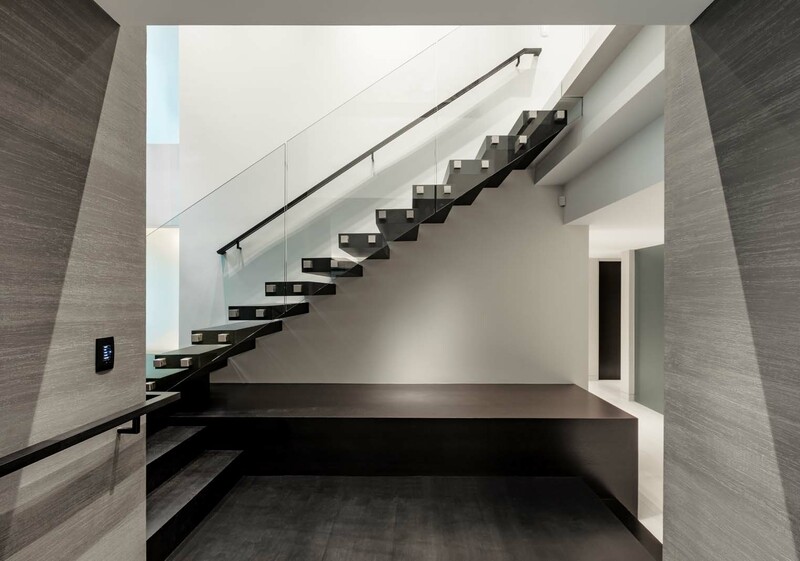 The walk-under entrance creates an intimate sense of arrival, opening into a spacious entry where a glass-walled staircase of cantilevered stair treads connects the main and lower guest levels. The walls below and next to the floating stair function as gallery space. The house also includes ramps leading into the home and an elevator; requests of the clients who intend to age-in-place within the home. A glass-walled staircase of cantilevered treads connects the main and lower levels, and the surrounding walls function as gallery space. The open first level combines kitchen, dining, and living room in one elegant space. The fireplace of striated Venetian plaster with an Alabama limestone surround anchors the room, with clerestories bringing in an airy, floating sensation, as well as light and views into the trees. The built-in dining banquette is a space-efficient nook for entertaining, with the recessed wall providing depth and relief for artwork and the soffits offering scale and intimacy over the dining table. Elegant yet simple, the interiors of the 5,000-square-foot-house feature a gray and black color palette accented by the contrast of the light wood floors with darker planes. The kitchen area was organized in order to merge functionality and aesthetic. The island was layered to lighten its profile and read as a sculptural form. The refrigerator is housed in a wood wall cabinet that balances the room with the fireplace. In the kitchen, materials include a combination of Cleaf laminate for lower cabinets, a matte paint for upper cabinets, dark-stained rift white oak for the full height cabinets, and a chem metal matte black veneer for the island. “Continuous hardware keeps the lines clean, adding to the modern look and feel of the kitchen,” Streeter explains. Kitchen, dining, and living room combine in one elegant space in the open first level of the home, where the layered design of the kitchen island lends itself to a sculptural form. The clients suggested the gray and black color palette, which eventually became themes—one of which was contrasting the light floor with darker planes. The floors were created from maple trees removed from the site during construction. An intricate bleaching process revealed the wood grain, while a Rubio finish resulted in the floor’s delicate gray tone. Other significant rooms in the home include Christopher’s closet. Designed per her request, the room functions as a sanctuary in which she can sit with friends beneath the skylight; curate and display the treasures she’s brought into her life, like art objects; and experience quiet and calm. The master bath was also designed for relaxation with steam shower, soaking tub, and dual sinks with mirrors bookended with glowing inset lights. In the master bath, porcelain finished with a high gloss adds shine to the space’s spa-like atmosphere. “The master bath finishes were selected to introduce continuity and flow with the kitchen,” Streeter explains. “The same porcelain countertop was used in the bath and the same paint color was used in the dressing room—but in a high-gloss finish for added reflection. Rift white oak was bleached and finished with a white stain and used in the master bedroom, bath, and dressing room.” The vertical form in the master bath is consistent with the planar architecture throughout the rest of the house. “They wanted a home they could live in for the rest of their lives,” Norman says of the clients. “It has plentiful storage. Everything has its place. They both have offices with views of the woods. The house will scale with them as they age in place.” Constructed with triple-pane glass, and featuring in-floor heat with auxiliary forced air, the home also has lighting, comfort, and security controls changeable with the touch of a button. Camille LeFevre writes about architecture and design for Midwest Home and other regional and national publications.